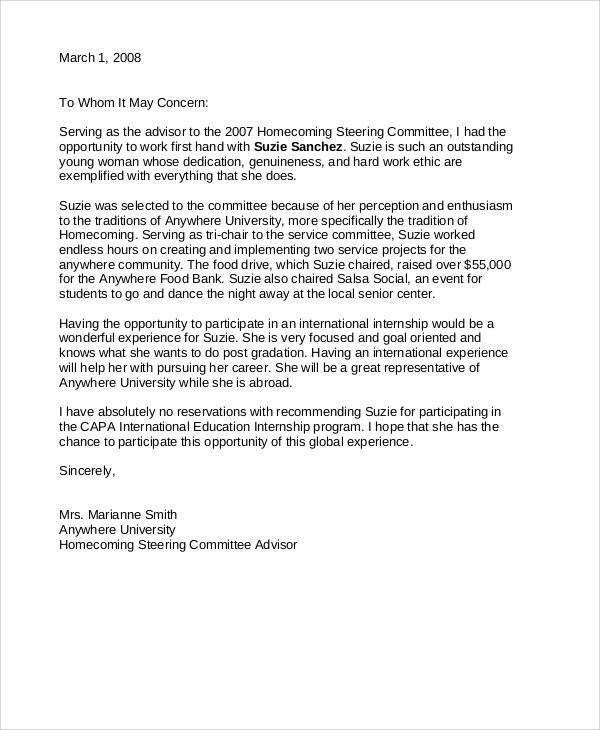 A recommendation letter is the document that contains the information about an individual’s characteristics, abilities, and qualifications from another person’s viewpoint. 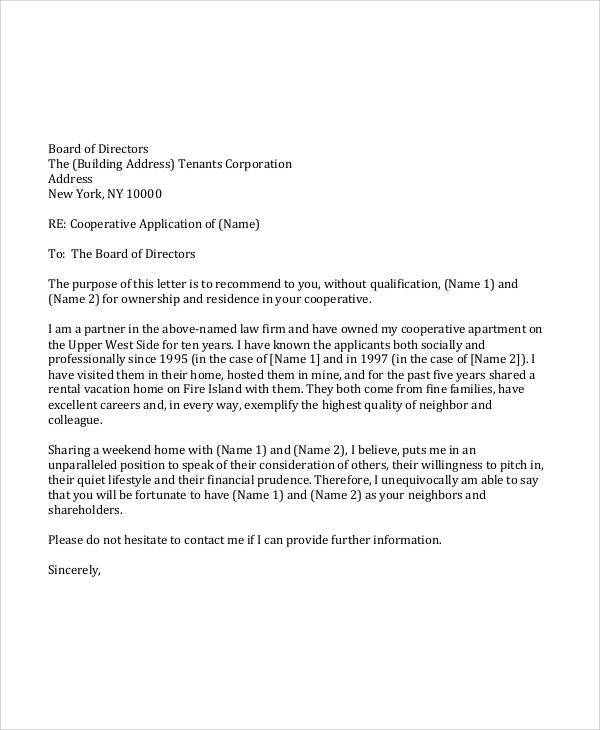 People who need recommendation letters ask references to write the document for them. 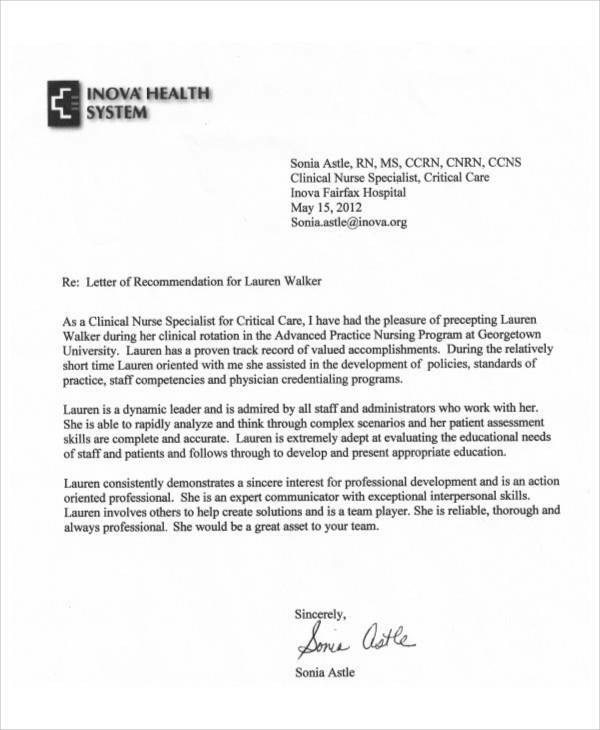 There are different kinds of recommendation letters that can be used in varying situations and processes. 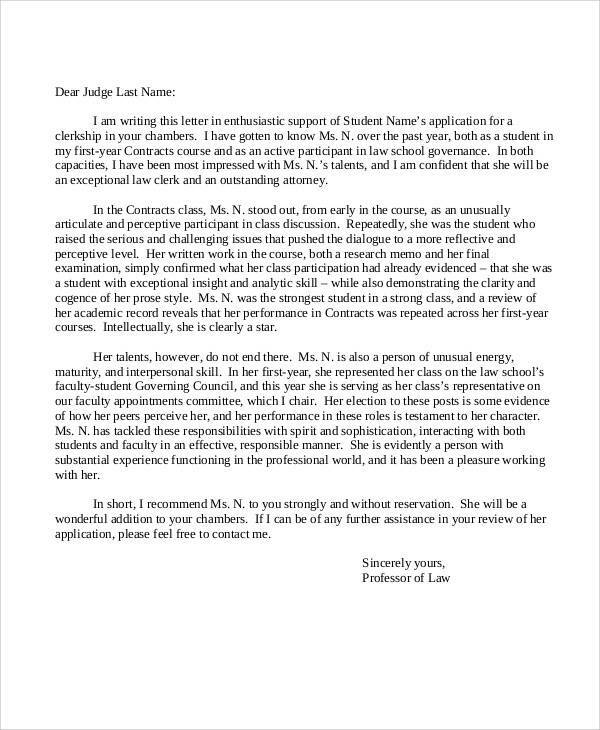 In creating a recommendation letter, it is highly suggested to use a template so that you will be guided in making this letter look well-curated and professional. 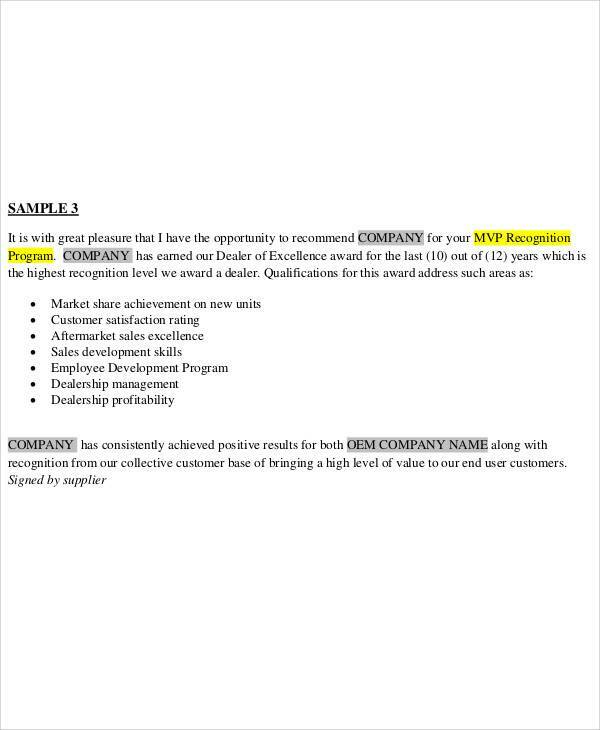 Do not worry on where to find these templates as we have collected comprehensive recommendation letters in portable document format in this post. 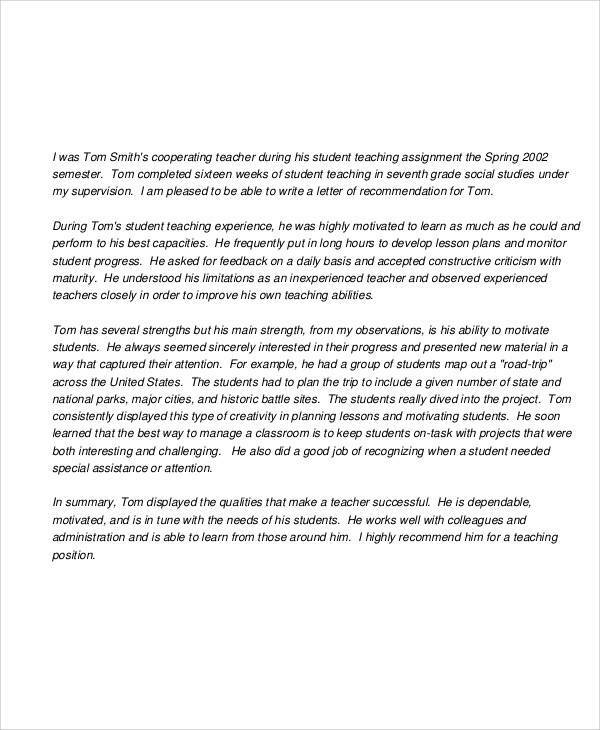 More so, we have more Recommendation Letter Samples in the provided link so you can have more references. 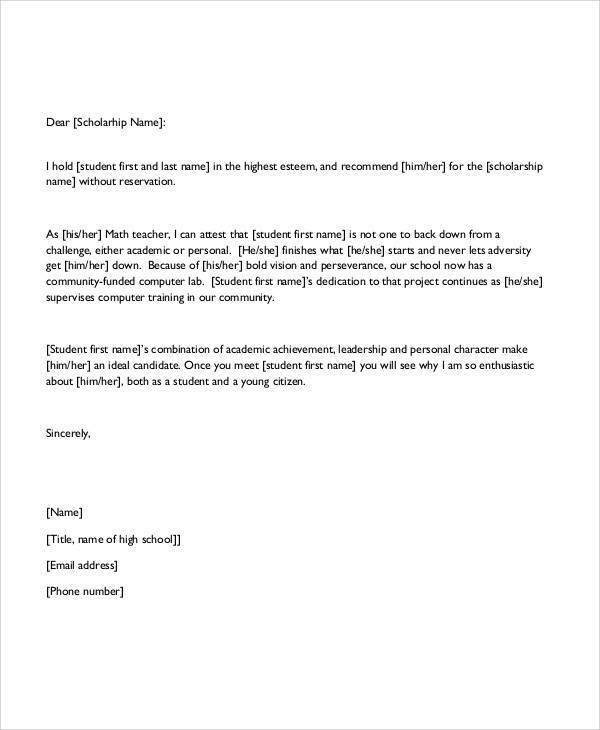 Scholarship Recommendation Letters can provide the details about the qualifications of the individual who is applying for a scholarship, especially in the field of academics. 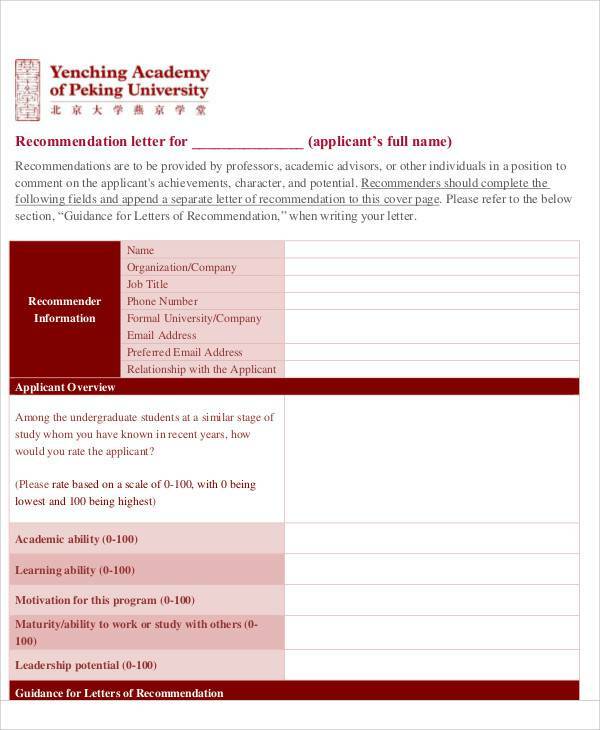 Scholarship recommendation letters can list down the achievements of the candidate, which can be the basis of organizations to identify the additional value that the candidate can provide to the academic institution where the scholarship will be used. 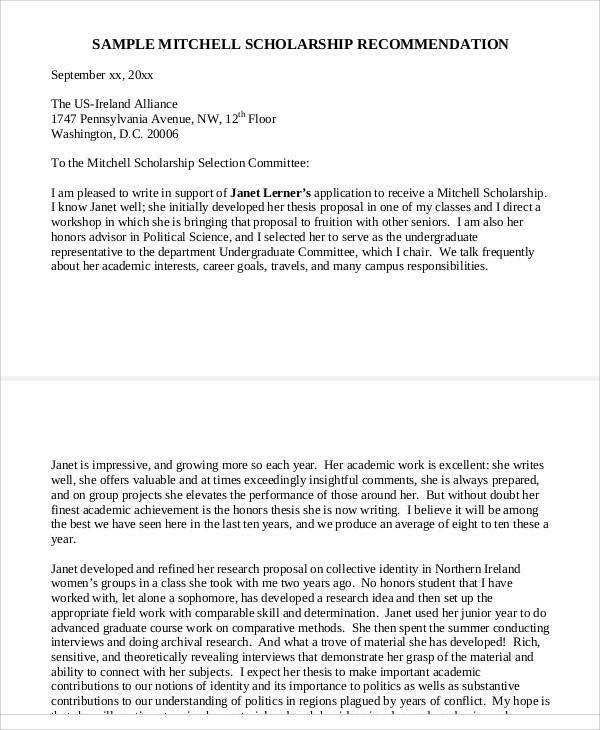 Scholarship recommendation letters should identify the reasons why the student needs the scholarship. 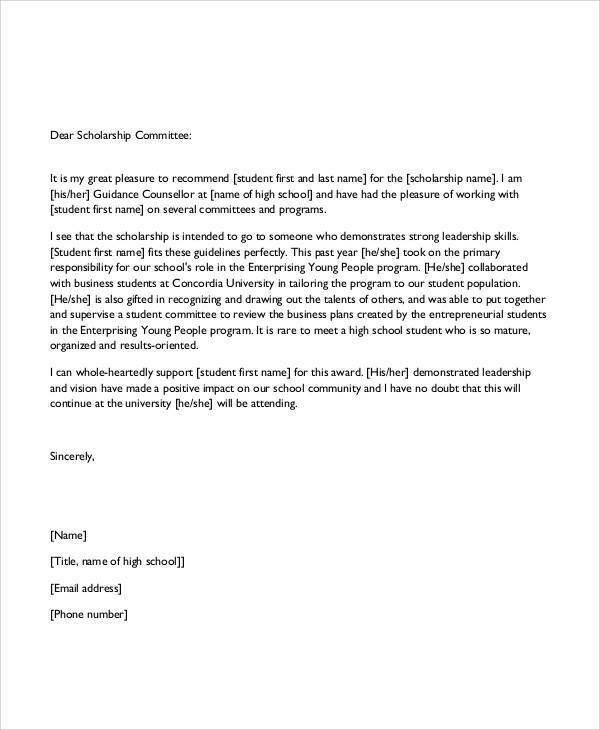 This letter may also include a few facts about the student’s background both in academics and in his/her personal life to fully provide information on why the scholarship should be given to the student candidate. Your current adviser or any other adviser that has handled you in a particular academic year is the top choice for this undertaking. This is for the reason that class advisers are aware of your academic performance. Your research adviser, if a research paper is a part of your curriculum during your previous academic years, can also help you in this undertaking as the process of researching is very tedious. Hence, your research adviser may not only talk about your intelligence but your ethics and personal character as well depending on how you handled the processes of the research. 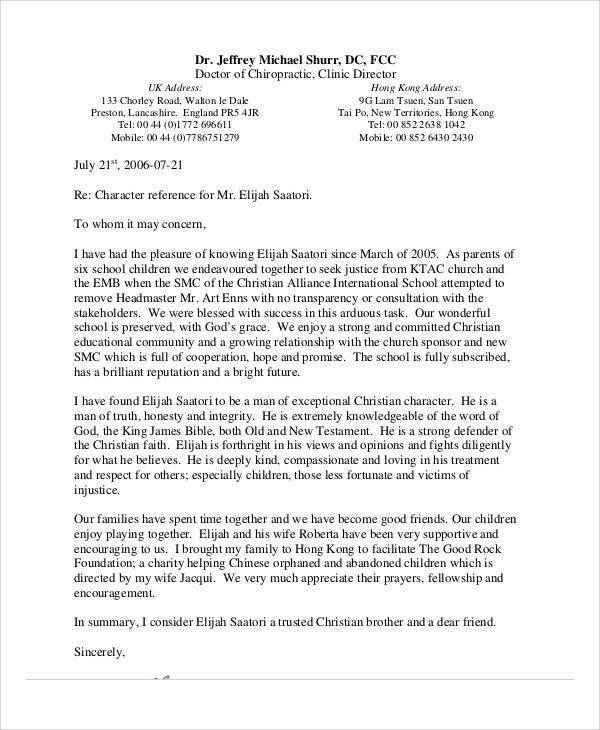 Volunteering activities usually require personal character recommendation letters. Some people ask the reason behind this as someone who would like to be a volunteer should always be welcomed and not screened. However, the process of volunteering takes a lot of efforts before the program completion. More so, an individual should always be trustworthy as some volunteering programs need cash handling and material storage. 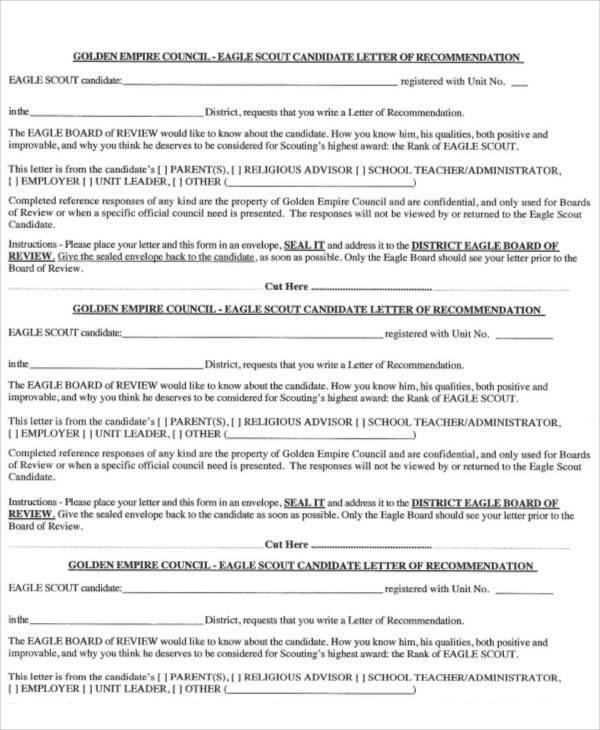 Running for a political post, may it be within the academic institution or even on some localities, also require the submission of personal character recommendation letters for its candidates. 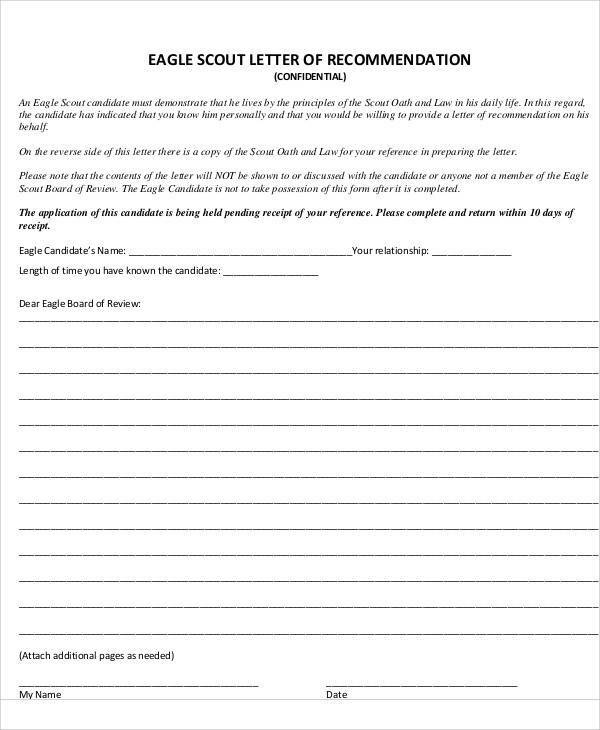 It is very important for the screening committee to assure that the candidate has an ethical background and that he/she will not use the position for his/her own benefits. 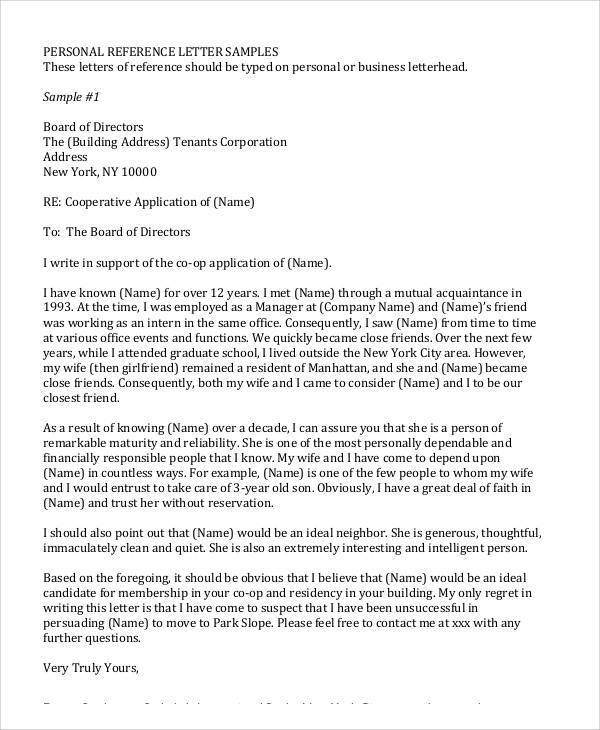 Applying for a membership, especially for corporate club and organization memberships, may sometimes need a personal character recommendation letter from the applicants. There are business entities who need to assure that the people who will be tagged as their members have the qualifications that can maintain the prestige of the business, which can fully affect the perception of the public about its brand and operations. 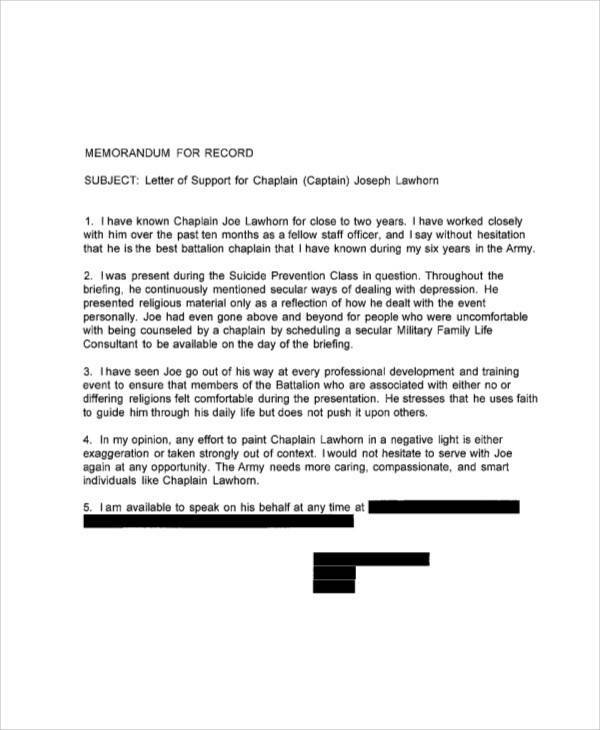 Take note that a Personal Letter of Recommendation is different from a personal character recommendation letter. 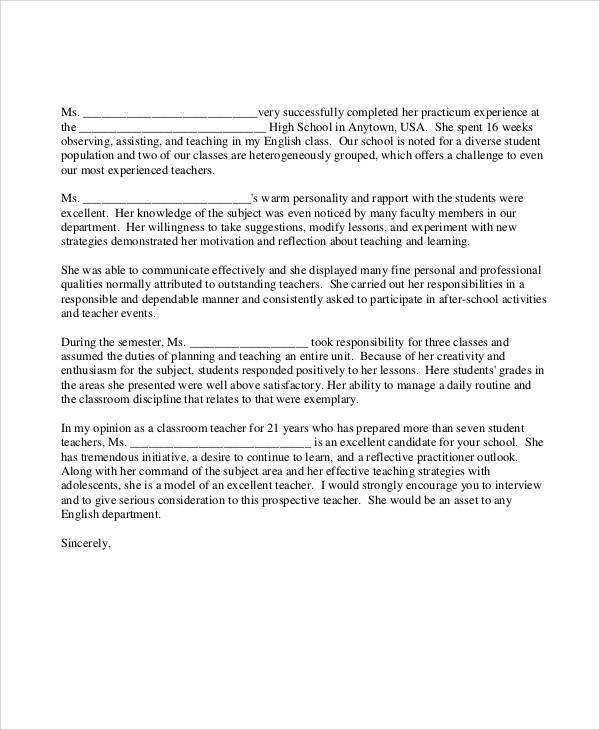 A personal recommendation letter is the usual recommendation letter that is “personally” preferred to be written by a reference to help the individual who needs it. 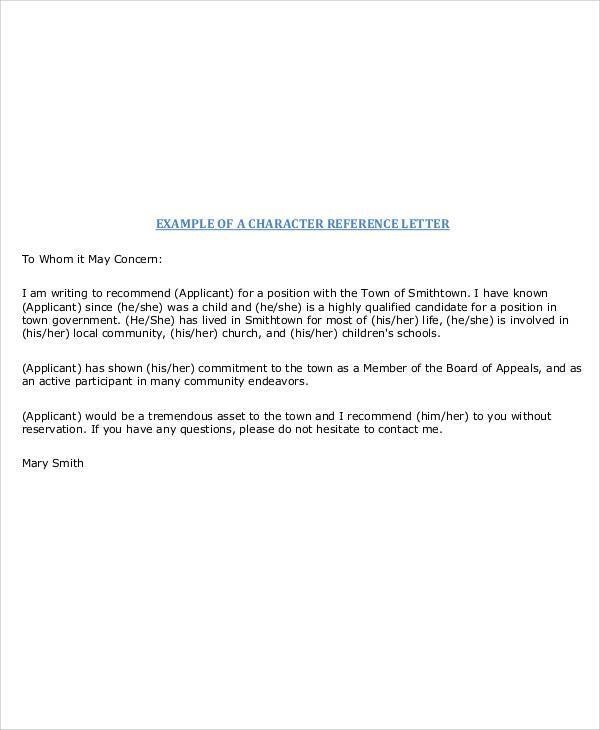 On the other hand, a personal character recommendation letter deals with the perception of the reference regarding the character of the individual to whom the letter is for. 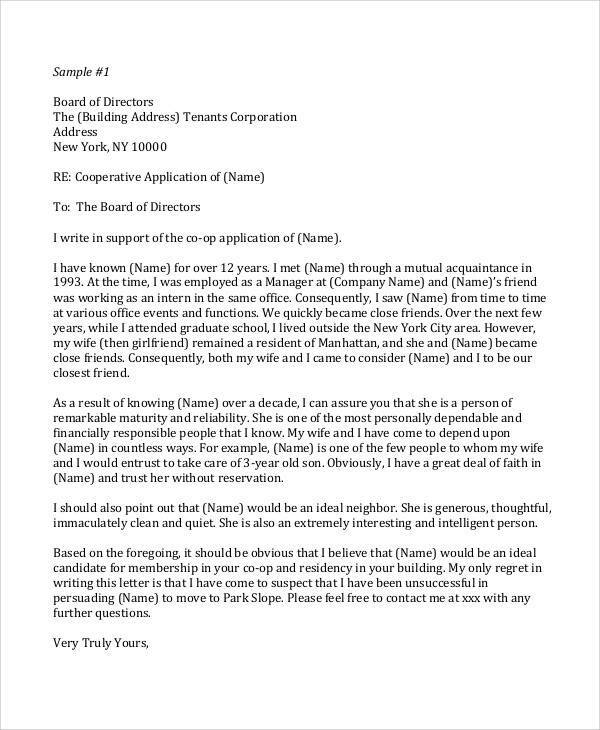 A Job Employment Recommendation Letter is always a part of the requirements of businesses to the applicants who would like to be hired for a particular job position. 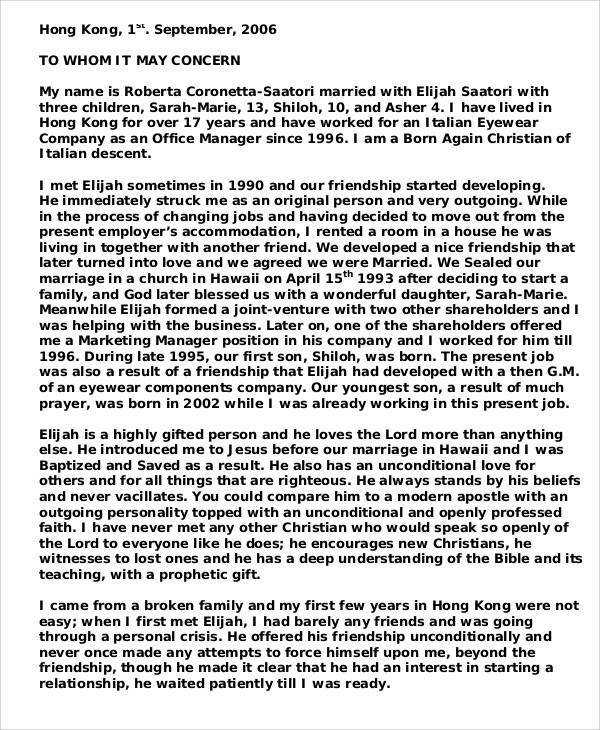 A job employment recommendation letter is an essential part of the hiring process as it provides additional information about the applicant. List down the strengths of the applicant including his/her skills, technical abilities, talents, and professional work experiences. Make sure that the job employment recommendation letter will provide information about the relation of the experiences of the applicant to the work position that he/she is applying for. You can state your knowledge about the applicant’s previous job positions and the names of the companies where he/she has already worked for. Though these items are already included in the applicant’s resume, you can actually incorporate a few instances that happened during those previous employments. If you have an idea about any of them, identify the achievements of the individual to whom the letter is for. It is suggested that you will write the achievements that can actually be perceived as items that can provide additional value to the operations of the company. 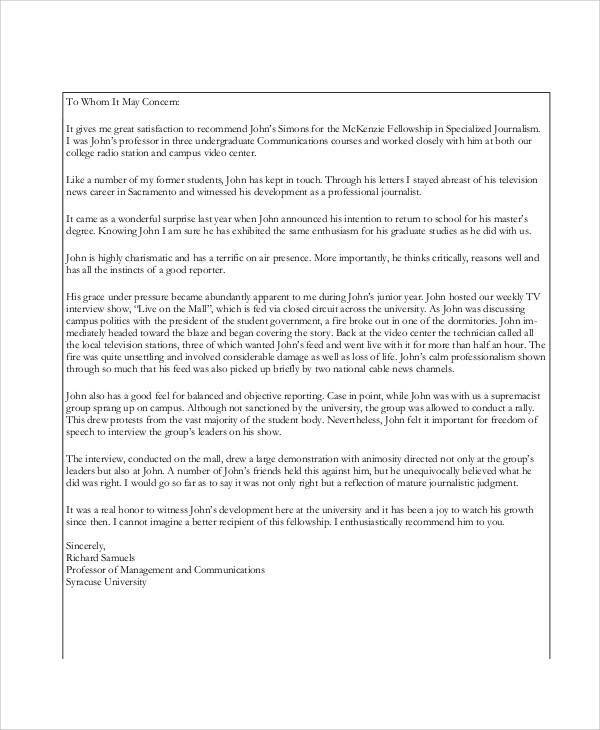 Basically, a promotion recommendation letter is a way of showing the agreement of a person to the promotion that is expected to be given to another employee of the company. There are companies who require supervisors or managers of a division, where an employee who is expected to be promoted is stationed, to write a promotion recommendation letter. 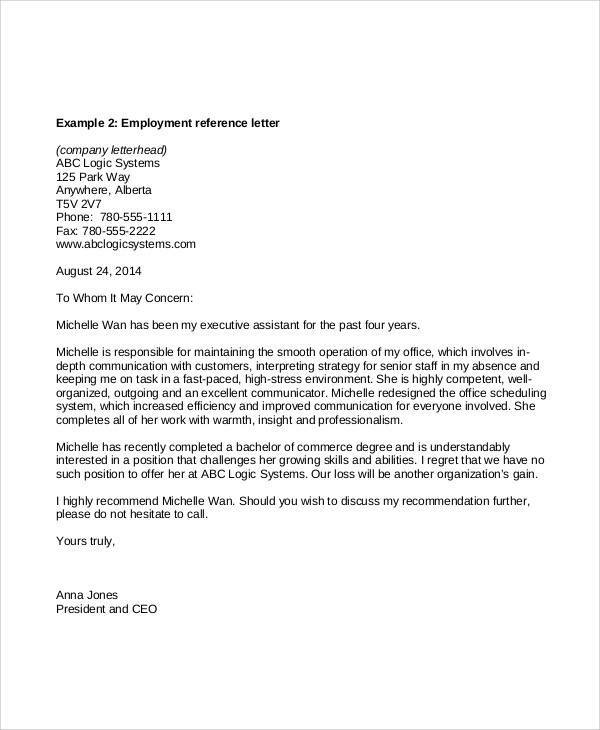 As a part of the company regulations, creating a promotion recommendation letter is truly needed in the process. 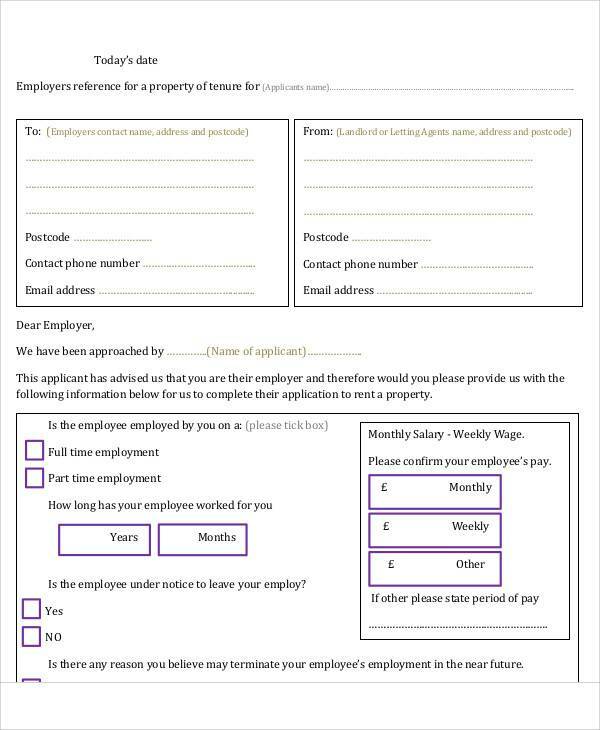 Some promotion recommendation letters are needed by human resource departments for recording purposes, especially for companies whose scope of operations and number of workforce is big. Promotion recommendation letters can also be written if there are two people who are up for promotion and the management and other people involved in the decision needs to recommend just one of them for the specific professional work position to be filled. 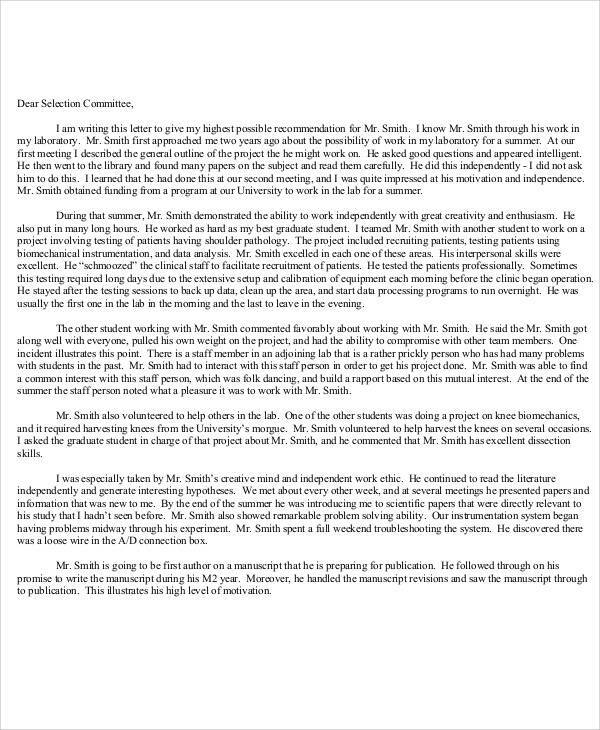 A graduate school recommendation letter is written by a reference who would like to recommend a student to a graduate academic institution. Graduate studies are advanced academic degrees in which an applicant is required to have finished an undergraduate course prior to application. The relation of the undergraduate course of the candidate to the graduate study that he/she would like to take. The level of intellect of the candidate and his/her personal character, which can be very helpful in allowing the candidate to adapt to the processes that he/she will undergo if the committee will allow him/her to be admitted to the academic institution. The result of the undergraduate research study of the applicant. The enthusiasm of the applicant in research and its procedures. The value that the candidate can add not only to the school where he/she is applying for but also to the community. The goals and objectives of the candidate, especially those that can be achieved through the help of a graduate study admissions. An internship is a program that students need to undergo as a part of their academic requirements. The process of internship allows students to experience how it is like to be a part of a professional working environment. There are different kinds of internship program that cater to the needs of students who are studying in various fields. Though it is not a formal employment, internship applicants also need to submit documents before they will be accepted by a company. More so, they need to pass the requirements and qualifications set by the business to find the fit intern for their daily work operations. Your capability to do the work functions of the internship position that you are applying for. The reason for the internship, which is mainly focused on the requirement of the academic institution where you are currently enrolled. Your character and qualifications that your reference is aware of. This can also help your prospective employer to identify whether you can be resilient in terms of transitioning from an academic to a work environment. The relation of your academic undertakings to the internship program that you would like to have. It is very essential for your course to be related to the nature of operations of the business where you would like to be an intern. The experiences and expertise that you have that can help you to add value to the company even if you have no prior professional work experiences. 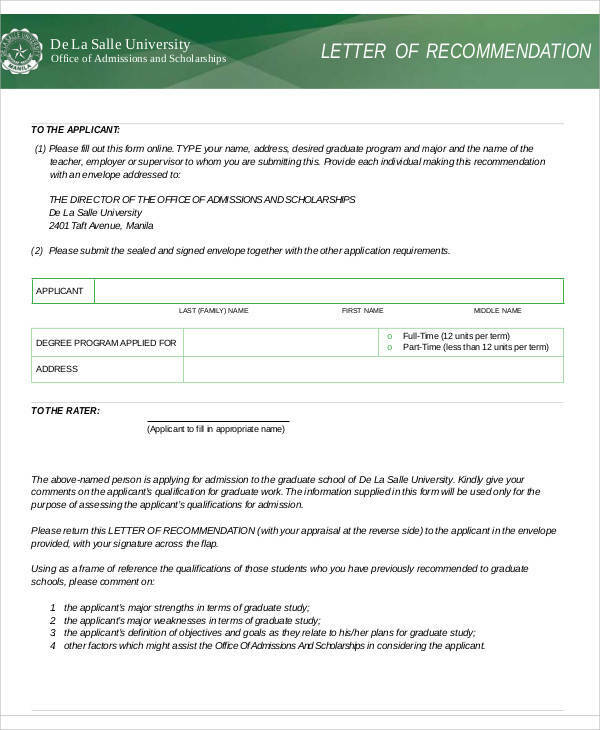 Aside from our recommendation letter samples and templates, our samples of Letter of Intent templates are also available for download. 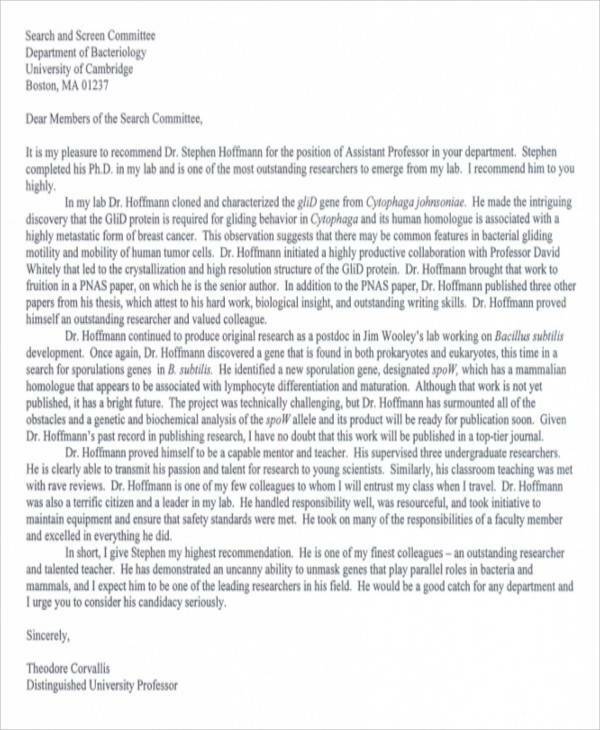 The reference who will write your recommendation letter should be qualified to write the letter for you. 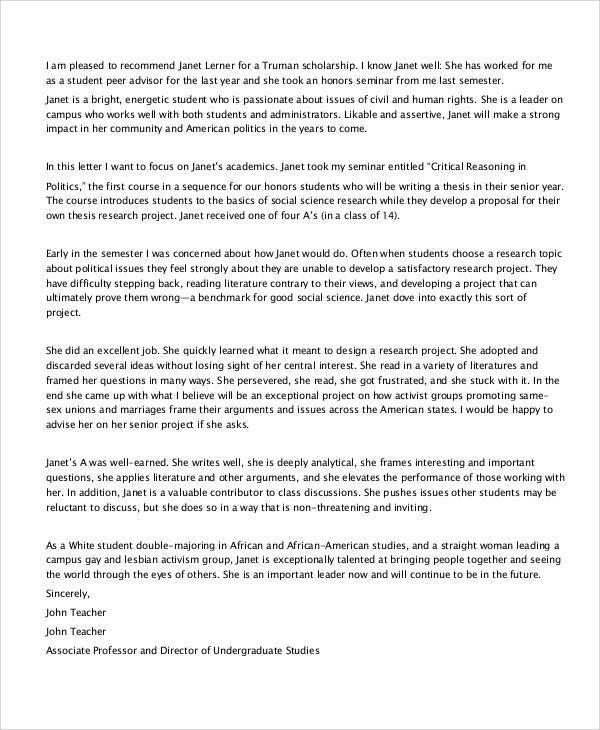 He/she should have the experiences in the field where you want to immerse in, especially if your recommendation letter will be used for work application processes. The number of years that your reference has known you will always be one of the details that the people who will assess the recommendation letter will look for. 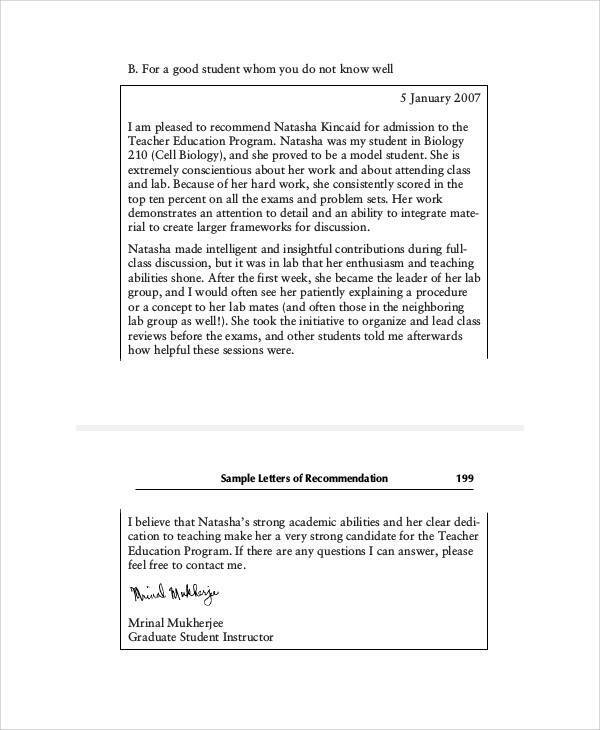 The longer the time of interaction or professional relationship between you and your reference, the more valid the recommendation letter will be. Your reference will also be subjected to a background check just like you. However, the process of background checking is lighter compared to that which is done to you. The company or organization where you are applying for just needs to assure the credibility of your reference, which is why this particular process is done. 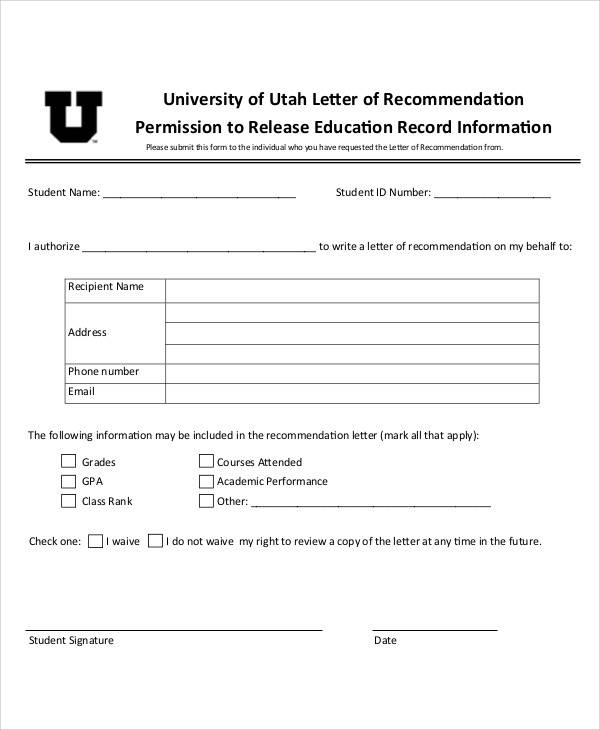 Make sure that your recommendation or Reference Letter will truly stand out by starting off with selecting the appropriate reference who will write the letter for you. 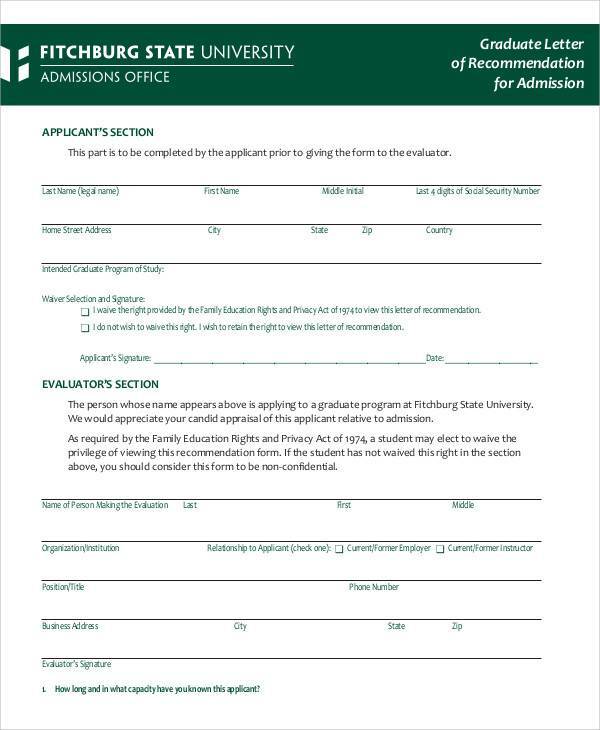 Make sure that you are aware of the purpose where the recommendation letter will be used. 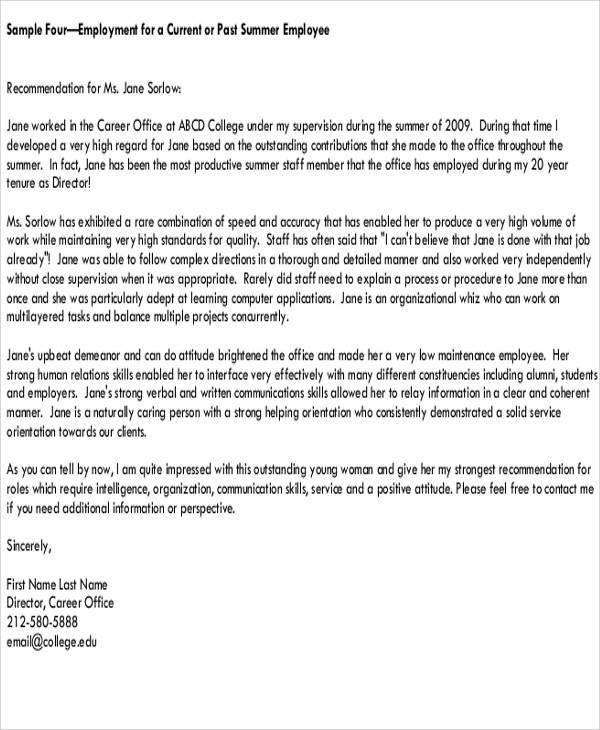 This will help you to target the needed information that should be placed in the recommendation letter. Provide a short background about your qualifications and your professional relationship with the person who requested you to write a recommendation letter. 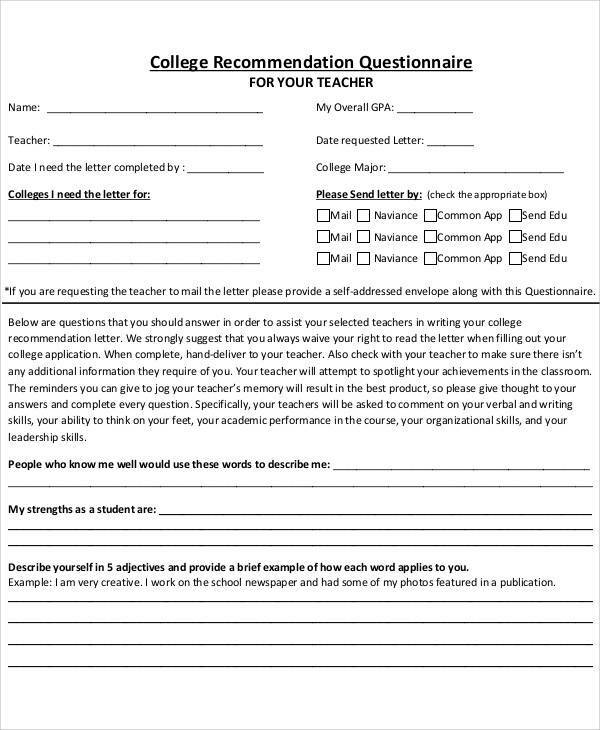 Use a comprehensive Reference Sample Letter template to guide you in creating both the format and the content of the recommendation letter. Always be direct to the point and precise with your discussion. It is very important for you to think of the structure of your thoughts and how they are put into writing. 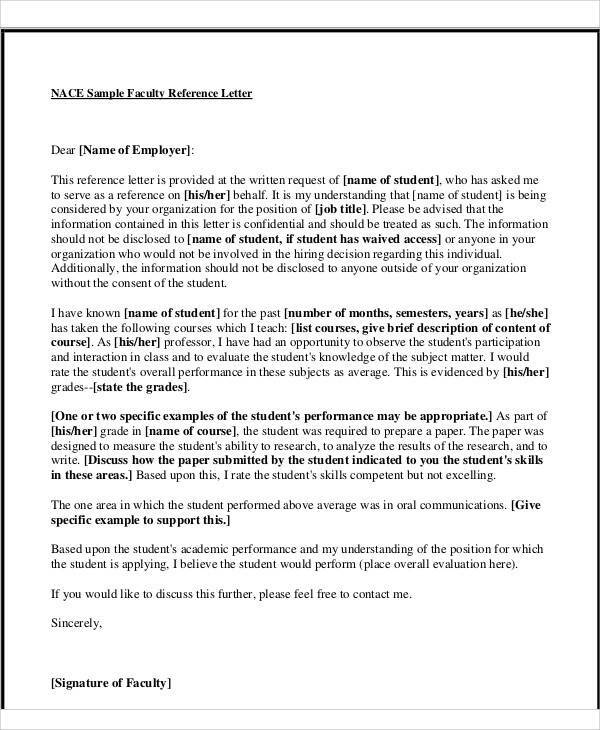 Make sure that the people who will read the recommendation letter will have a smooth understanding of the overall content of the recommendation letter. 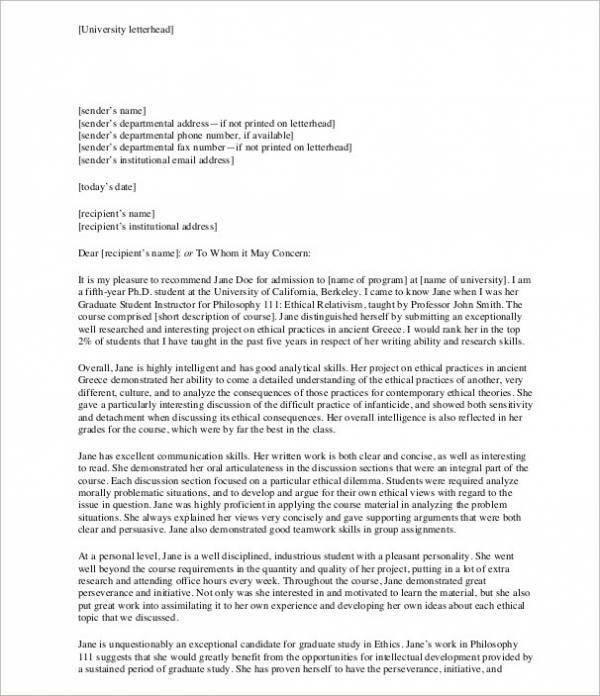 Aside from our samples of recommendation letter templates, you may also be interested to browse through and download our samples of other Formal Letter Formats in the specified link.